A new research study out today suggests that - at least at a neuronal level - agreement is much more satisfying than disagreement. Researchers at the Wellcome Trust Centre for Neuroimaging at UCL and Aarhus University in Denmark have found that the 'reward' area of the brain is activated when people agree with our opinions. The study, published today in the journal Current Biology, suggests that scientists may be able to predict how much people can be influenced by the opinions of others on the basis of the level of activity in the reward area. In a study involving 28 volunteers in the UK, Professor Chris Frith (UCL Wellcome Trust Centre for Neuroimaging) and colleagues examined the effect that having experts agree with a person's opinions has on activity in their ventral striatum, the area of the brain associated with receiving rewards. Expert opinions about a piece of music produced more activity in this brain area when the subject shared the opinion. Expert opinions could also alter the amount of ventral striatum reward activity that receiving the music could produce - depending on how likely the person was to change his or her mind on the basis of those opinions. Before the task, each volunteer was asked to provide a list of 20 songs they liked, but didn't currently own. They were asked to rate the songs on a scale of one to ten depending on how much they wanted the song (a score of ten indicating that they wanted the song very much). The subjects were then placed in a functional magnetic resonance imaging (fMRI) scanner, which records brain activity by measuring related changes in blood flow. They were shown one of the songs they had requested and one from a set of the previously unknown songs by Canadian and Scandinavian artists and were asked to indicate a preference between the two. The researchers then revealed to the volunteer which of the two songs the two 'experts' preferred. "It seems that not only are some people more influenced by the opinions of others, but by looking at activity in the brain, we can tell who those people are," said Professor Frith. "We all like getting rewards and this is reflected in brain activity in the ventral striatum," said Dr Daniel Campbell-Meiklejohn from the Centre of Functionally Integrative Neuroscience, Aarhus University, Denmark. "Our study shows that our brains respond in a similar way when others agree with us. One interpretation is that agreement with others can be as satisfying as other, more basic, rewards." 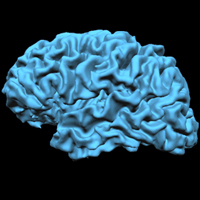 The Wellcome Trust Centre for Neuroimaging at UCL is an interdisciplinary centre for neuroimaging excellence. It brings together clinicians and scientists who study higher cognitive function using neuroimaging techniques, with the goal of understanding how thought and perception arise from brain activity, and how such processes break down in neurological and psychiatric disease. The centre's research groups study all aspects of higher cognitive function including vision, memory, language and reasoning, emotion, decision-making and motor control.